I took this photo a while ago, immediately fell in love with it, decided it was too dark, and relegated it to my personal file. I came across it yesterday and fell in love with it all over again. When I first started this blog, I found myself hesitating over certain photos, wondering if they were good enough to post. I also found that the ones in question usually ended up being quite popular. So I promised myself I would always listen to my heart, go with my first impulse, and the heck with everything else. But once in a while I forget about that promise. So here, finally, is this photo--because I love it. And that is that. I'm glad you followed your instincts! Wonderful photo, Farmgirl - I feel peaceful just looking at it. That's the Missouri I love. Beautiful photo! Now that is worth waking up for! I can see why you love it. This photo is very spiritual. It is very pretty, I really like it alot. I am glad you followed your heart. I love this one -- and the recent one with the last ounce of sunlight lanketing the farm before sleep. My father lived in Missouri for 15 years before his death; your photos remind me of why he loved it there. Am glad you loved this photo enough to post it and share. You still have your knack and you KNOW your FG Fans love them all! Have a great afternoon! Good for you for following your instincts Susan and then sharing with us. Beautiful photo. Don't you dare sit on photos like this again! It's wonderful and definitely reflects the best time of the day. Almost heaven! 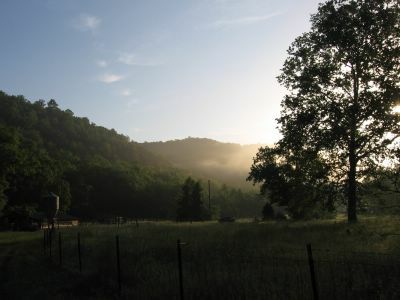 I remember mornings as beautiful as this one when I used to visit friends in the Gainsville, Mo. area. Also, born and raised a city girl, I never "really" saw the Milky Way until looking at the stars at night from the darkened fields there. i really like this photo! you did right to put it up! nice place to wake up!